Tim and I weren’t planning to spend more than two weeks in Arizona when we arrived there on February 20. Still, we had several things on our “to-do” list, including touring several units of the National Park Service, spending time with friends and attending the Camping World/Good Sam Rally. Visits would have to be short if we were to fit everything in. Our first stop was Chiricahua National Monument. Located in the far southeast corner of Arizona, Chiricahua is one park that neither Tim nor I had ever visited. We both agreed that it was worth the wait. Known as the “Land of Standing Up Rocks,” Chiricahua is known for the rock pinnacles that loom over the countryside. 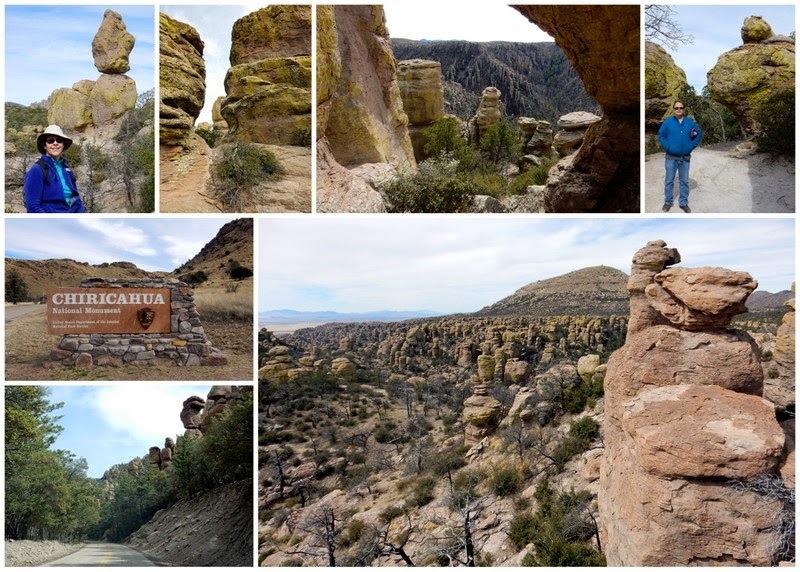 We learned that Chiricahua is a sky island, an isolated mountain range that rises above the surrounding grassland sea, and the scenic drive in the park took us to the summit. The pinnacles take on all sorts of shapes and forms, and many of the formations have imaginative names. To really appreciate the rock formations, you really have to hike among them. And that is what Tim and I did. We took several shorter hikes, and I couldn’t seem to stop taking photos at every turn. As we made our way among the countless pinnacle formations, I was surprised to find that so many of the rocks were cloaked with brilliant green lichen. The color was stunning. We enjoyed the hikes immensely, but reluctantly had to turn back because of the relentless wind. I thought we were going to be blown away! 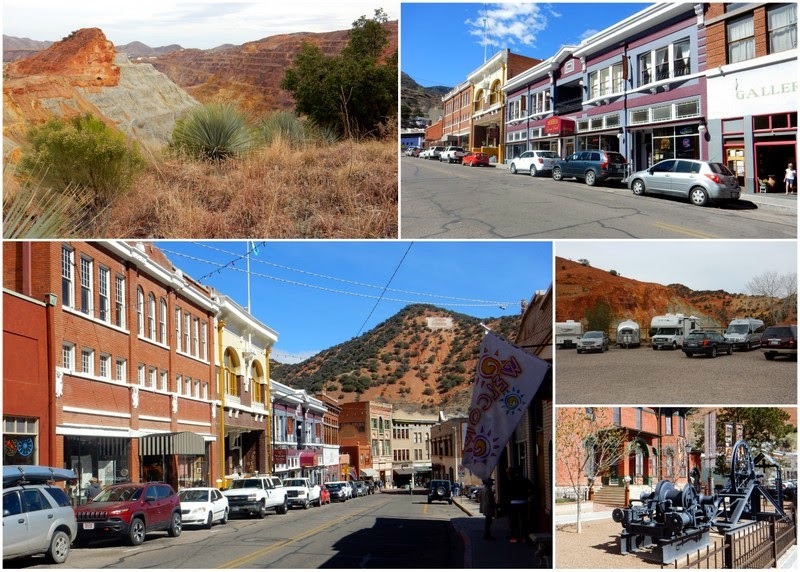 From Chiricahua, we drove even farther south to the historic, former mining town of Bisbee. Our home for the night was an in-town campground that overlooked the open pit mine. Now that was a different view! Bisbee is a very cute town with a great art scene and excellent restaurants. We stumbled upon a Vietnamese restaurant with just a handful of seats and enjoyed a fabulous dinner. We spent the next morning wandering through the town and checking out a few of the shops. Bisbee is definitely a town worth spending some time in. The main reason for venturing into southern Arizona was to visit our friends Judy and Peter, who spend winters in Sierra Vista. We hadn’t seen them since Judy retired from Rocky Mountain National Park several years ago, and it was so nice to catch up and get to know them a bit better. They treated us to a delicious home-cooked dinner our first night in town – the salmon and cornbread were amazing, and the wine was perfect. Driveway camping was an added bonus. Judy and Peter were in the process of re-landscaping their yard, and it was especially nice to learn about their plans and share their excitement about the project. We took a day trip to Coronado National Memorial, an odd little park. 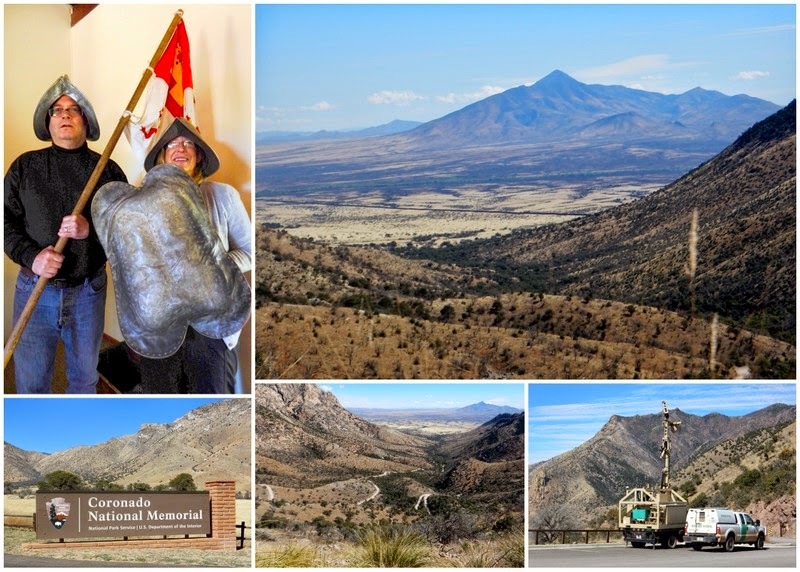 Coronado National Memorial commemorates Francisco Vásquez de Coronado’s expedition in the 1500s into what is now the America Southwest, but it is likely that he never set foot in what is now the park. Still, the park is beautiful, and the views from the top of Montezuma Pass were breathtaking. The park is very close to the U.S.-Mexican border, and Border Patrol vehicles were quite evident. From the top of the pass, we were also able to see the infamous wall that separates the United States from Mexico. That was a first for me. While we were at the park, we ran into Pam and John, whose blog I follow. I accosted them in the parking lot at the visitor center, and after they got over the initial shock, they seemed happy to meet us. I’ve read about how bloggers often run into one another, but this was the first time I had ever stumbled upon someone on the road. 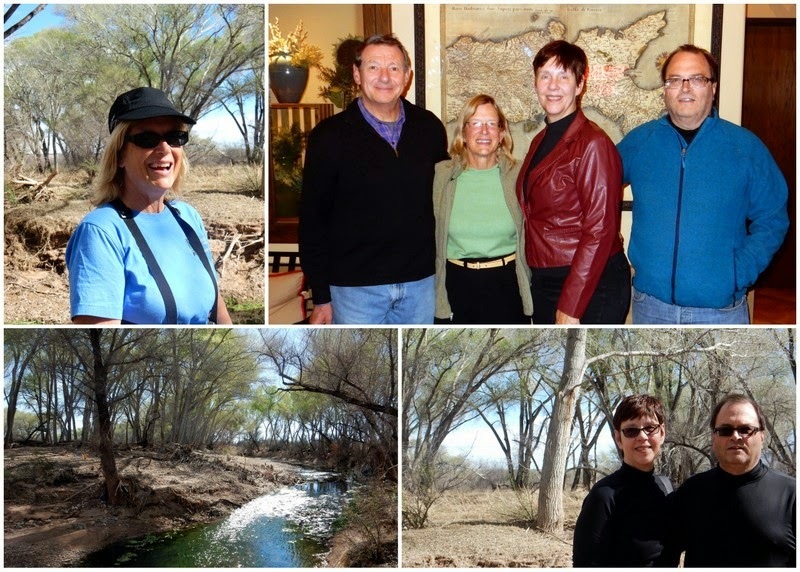 Judy took us to a favorite spot along the San Pedro River where we saw a stand of cottonwood trees that were already leafing out. It was so nice to see green leaves after the long, dreary winter. We ended the day with a lovely dinner at Judy and Peter’s favorite Italian restaurant. I had one errand to accomplish while we were in Sierra Vista, and that was getting fingerprinted. Tim and I will be in Alaska this summer and will be working at Sitka National Historical Park. For some reason, that park required me to undergo a background check, and Sierra Vista had the necessary facility. I haven’t heard back from the park, so I think I passed. It was sad to leave Judy and Peter, but it was time to head towards Phoenix. We stopped for the night in Casa Grande and took the time to visit Casa Grande Ruins National Monument. 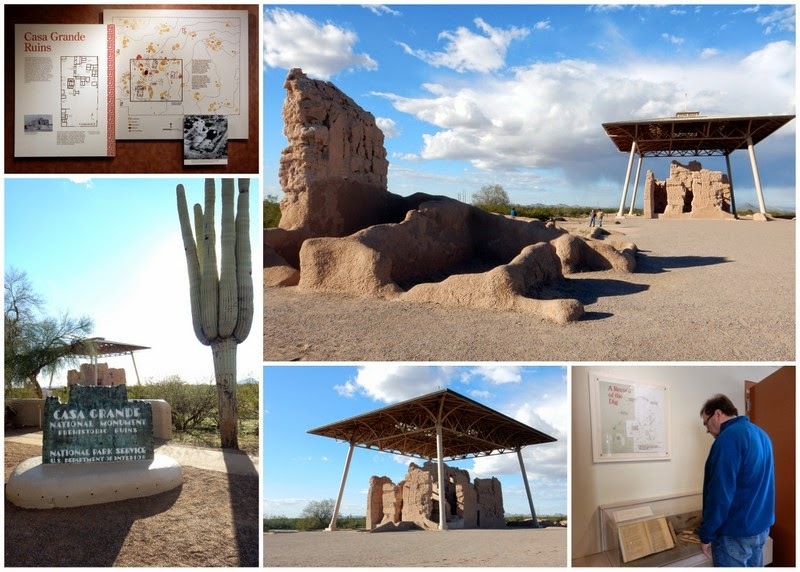 Casa Grande was impressive and is the largest known structure of the Ancestral People of the Sonoran Desert. Today, a steel-and-concrete canopy, built in 1932, continues to protect the Great House. The campground where we stayed in Casa Grande was an older RV park. This was my first real taste of an Arizona snowbird park, and I quickly decided that this is not the type of park where I’d want to spend the winter. The sites were so close together that our neighbors could probably have heard us sneeze. We next traveled to the western part of Phoenix and stayed at another snowbird park. Although this one was a bit more modern, I also knew right away that this was not where I want to end up. Our reason for coming to Phoenix was to attend The Rally, put on by Camping World and Good Sam. I had attended a previous rally before we embarked on our nine-month trip, but Tim had never been, so we registered for the entire event. 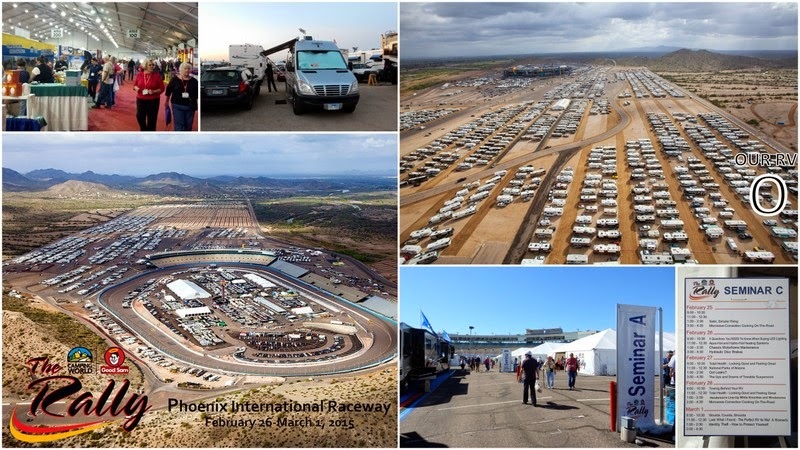 For four nights, we would be camped with several thousand other rigs on the edge of the Phoenix International Raceway. Arrival and check-in at the raceway was surprisingly smooth, and we got settled into our space rather quickly. The Rally consisted of exhibits, seminars and assorted activities, but we were there mostly to attend the seminars and check out the vendors. On our first day, it was hot and the sun was intense. There was little shade, and the seminars and exhibits were in tents, which provided little relief. We did a little shopping, waited in line forever for lunch, sat in on a few seminars, got overheated, and dragged ourselves back to our RV. I have to admit that I was just about ready to leave. I was not having a good time. Luckily, the next few days were much better and more fun. It was not as hot nor as crowded, or maybe we just knew the ropes. One of the highlights was meeting Dean from Leisure Travel Vans, the manufacturer of our RV. We looked at the Unity as well as a few other RVs, but mostly we went to seminars and did our fair share of shopping. We may not do much regular shopping, but we do shop at RV rallies and shows. New LED lights, microfiber products and microwave cookware and accessories were just a few of the things we couldn’t live without. Of course we also found other things that we didn’t even know we needed. As the Rally neared its end, the weather began to deteriorate, and a flood watch was in the forecast. Since we were finished by early Sunday afternoon, we decided to leave a day early so we wouldn’t have to deal with the rain, and mud, on Monday. We moved to another nearby snowbird park. Although the condition of the park wasn’t as good as the last one where we stayed, at least it had more character – trees! Many citrus trees loaded with fruit even provided a bit of shade. Staying at these three different snowbird parks really opened my eyes to the way of life for so many RVers. That’s not how I want to spend even part of a winter – these parks are just too claustrophobic for me. We had tried to get into the nearby county and state parks, but there was no availability. Unfortunately, booking far in advance is necessary. I know that I would have liked those parks, so it was frustrating that we missed that opportunity. Tim and I did take advantage of our time in the Phoenix area, and Tim was able to attend a Cactus League baseball game. 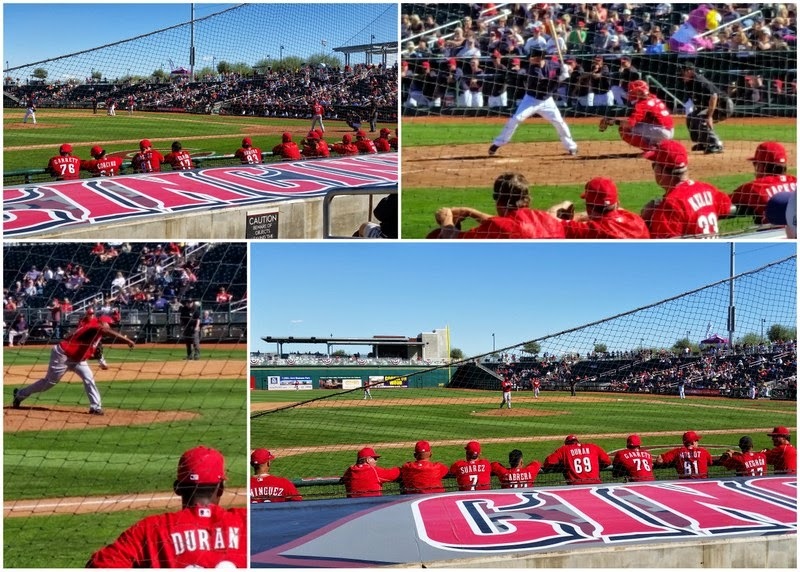 The Cleveland Indians were playing the Cincinnati Reds on the second day of Spring Training at Goodyear Ballpark. Cleveland beat Cincinnati 4-2. While we were in Phoenix, we also faced an important decision – where to go next. We really didn’t have a good answer. To the north, snow had been falling, and some of the public parks we looked at had not yet opened for the season. The private parks just didn’t seem too interesting. We spend a ridiculous amount of time trying to find some place that we would enjoy for a week. What we really wanted to do was chill after all of the running we’d done since arriving at Fort Davis. I finally said that I’d just as soon go back to New Mexico and to the park in Silver City that we really liked. And, that’s just what we decided to do. How nice to hear about your travels:) You had a very similar route to us. We loved the Chiricahua's!! The Loop hike was a real killer. We had to go back the next day to redo the last two miles the opposite way so we could enjoy it. That was a tough ten miles of steep up and down. But isn't it an amazing place! You should have come to Utah!! I do think this is my favorite state. Hope we meet up on the road again one day and can visit a little:) Thanks for the shout out! Thanks for the comment! I'm glad I was finally able to somewhat catch up with the blog and finish the post about our meeting at Coronado. Even though our time in Arizona was brief, we really did enjoy all of our stops. I'd love to go back and spend more time. I've been following your travels into Utah, and it looks like you are having amazing adventures. Tim and I have separately spent quite a bit of time there, before RVing, but we do want to go back - maybe next fall or winter. Our priority now is summer in Alaska, and we are finally on our way. I'll try and get the blog caught up so I can post "real time" while we're there. I also hope we can meet on the road some day. I'd love to get to know you in person. Can't wait to follow your Alaska travels. We haven't made the trip up there yet.